I’ve always wanted to travel to Japan and last month, that dream came true! 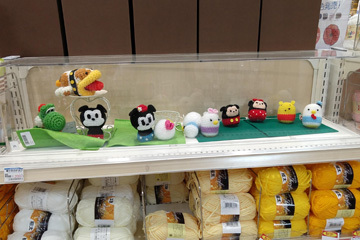 I LOVE Japanese crochet patterns and I wanted to visit the country where all this crochet loveliness originated! Since our youngest son was working in Japan for the first 3 months of this year, my husband and I seized the opportunity to travel there while he was still in the country. 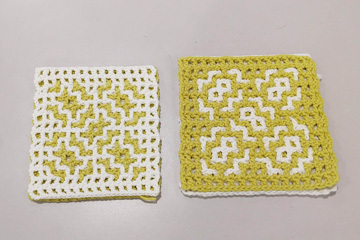 He’s back now (and we’re back, too), so it’s time I shared about the great crochet fun I had there (I’ll write another blog post about the other fun we had there being tourists and seeing some of their beautiful country)! 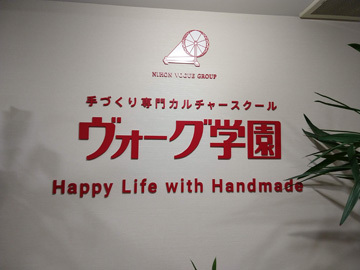 The highlight of the trip for me was visiting the Nihon Vogue Publishing Corporation main office, their Vogue Academy and their Keito Yarn Shop, all in Tokyo! 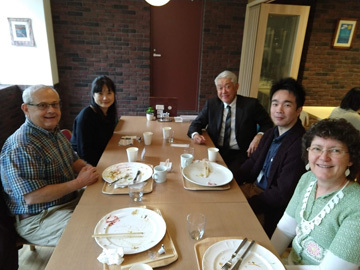 I arranged for this tour several months ago through email with Mr. Toshiharu Tsuda, who works for them. He set up a fabulous tour of their 3 facilities! I had an absolutely wonderful time, especially at their corporate office and their Vogue Academy. At the corporate office, which has 4 floors, I met several people: Mr. Toshiharu Tsuda, who I had been emailing for several months, Mr. Kenichi Funyu, who is an Adobe Illustrator extraordinaire and an editor at Nihon Vogue, Ms. Akiko Taniyama, who is the chief editor of Keitodama and Mr. Nobuaki Seto, the president of Nihon Vogue Corp! I felt like royalty there! They showed me all around their corporate office, including their Keitodama editing area. They brought out samples from the newest issue of Keitodama magazine (Vol. 181), too! They treated my husband and I to lunch in their cafeteria. 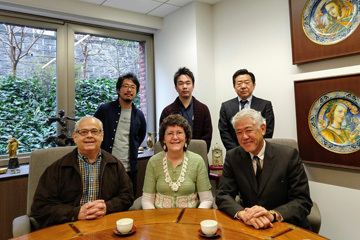 Mr. Seto, the president, even showed us his office, along with several keepsakes he has; one made from his father’s ties! 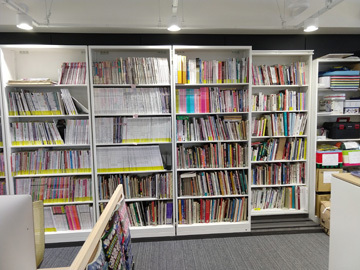 And he showed us their conference room with a bookshelf that runs from corner to corner along one long wall, filled with every issue of books and magazines that Nihon Vogue has published since the beginning of the company over 60 years ago (in 1954)! Wow! 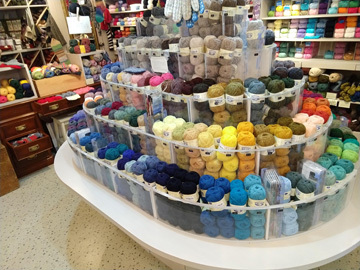 I was in crochet (and knit) heaven! 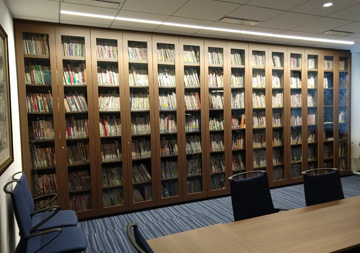 Nihon Vogue bookshelf wall with every issue they’ve published! After touring the corporate office and having lunch there, Mr. Toshiharu Tsuda took my husband and I to their Vogue Academy. 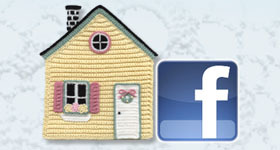 This is where their certified instructors teach all kinds of crafts, such as crochet, knitting, porcelain painting, embroidery, quilting, sewing and lots more (even cooking classes)! 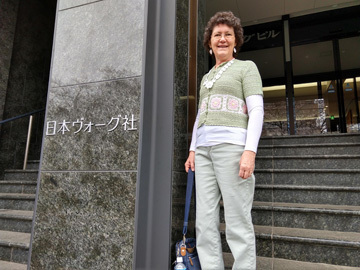 They have 8 locations in Japan with 1,350 courses and 18,000 students! Wow! Now that’s serious teaching! The Tokyo location, which we visited, has 13 classrooms. Mr. Hiroki Hashimoto gave us the tour at Vogue Academy. He showed us every class that was in session and we could see what the students were making in each classroom. 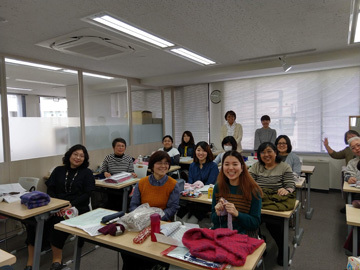 It was so much fun, especially in the 2 crochet/knitting classes! The students had finished or were working on garments in both classes. I was amazed at their skills and their projects! 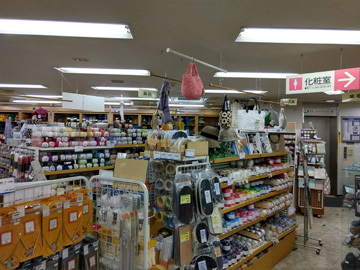 The Tokyo Vogue Academy even has a store there with yarns, books, and lots of tools/supplies that students can purchase. I showed Mr. Hashimoto my 2 favorite Nihon Vogue books from their store and he was so nice to give me those 2 books! 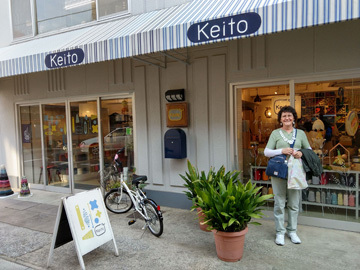 After the Vogue Academy tour, Mr. Toshiharu Tsuda took us to the Keito Yarn shop. It was a somewhat small shop, but it was laid out very nicely. They had yarns from all over the world, making it hard to decide what I wanted to buy there! I bought 2 balls of Lana Gatto Nuovo Jaipur, a 100% combed cotton yarn, which is made in Croatia and 1 skein of Hasegawa, a silk/mohair blend, which is made in Japan! I look forward to knitting and/or crocheting with both of these yarns! All in all, that day was magical for me! 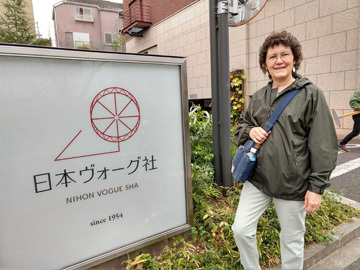 I LOVED meeting the Nihon Vogue employees, who were all very friendly and kind. I LOVED seeing their office, academy and yarn shop! I was surrounded with yummy goodness everywhere I turned! 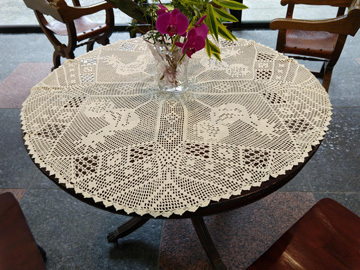 Their corporate office has a main lobby with tables covered in crocheted doilies and centerpieces! 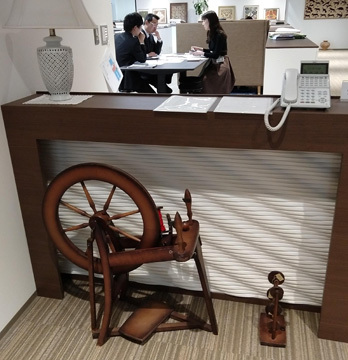 The entrance to their corporate office has a spinning wheel, which is part of their logo! And everywhere I turned, there were beautiful, inspirational things to see, from quilts on the walls to published books and magazines! That is a day I will never forget for the rest of my life!!! 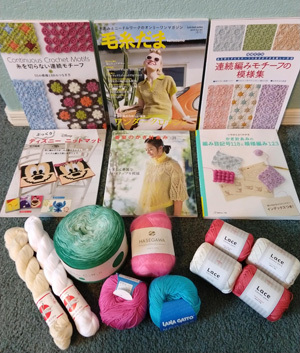 In addition to the Nihon Vogue tour, I also visited 2 craft stores and a 100 Yen store while we were in Tokyo, where I purchased yarns and crochet books! 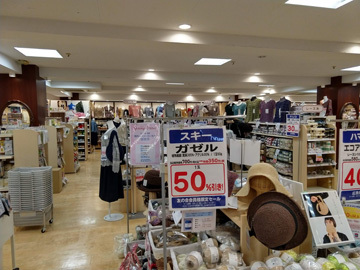 At the Yuzawaya store in Kamata (3 floors high), I bought a Disney crochet book for 1,111 yen and 3 skeins/hanks of cotton and cotton/acrylic yarn, both made in China. 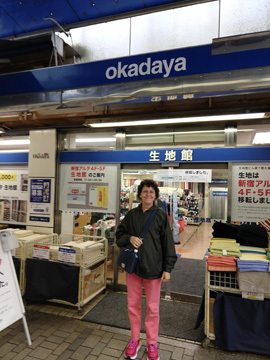 At the Okadaya store in Sinjuku (6 floors high), I bought 2 Nihon Vogue crochet books for 1,200 yen and 1,100 yen. At the 100 Yen store (called “Can Do”), I bought 4 skeins of cotton yarn made in China for 100 yen each! 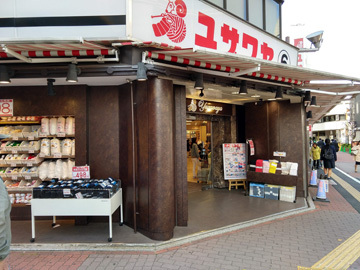 The exchange rate is currently around .009 yen to 1 dollar, so 1,000 yen is about $9.00. So as you can see, the yarn and books were quite reasonably priced! 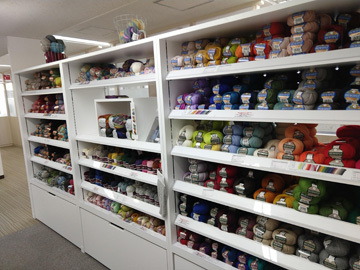 If you love to knit and/or crochet, Japan can be a wonderful place to purchase yarn/thread/supplies and books/magazines! If you’d like to read about the rest of our trip to Japan, subscribe to my blog to get an email when a new blog post comes out. Until next time! Happy crocheting! 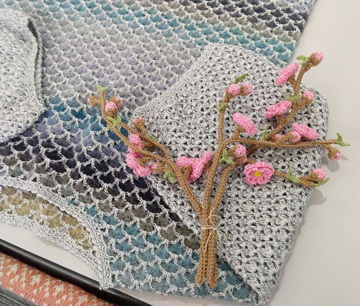 This entry was posted in Crochet book, Crochet tour, Japanese crochet, Traveling, Yarn and tagged crochet book, yarn. Bookmark the permalink. Thank you for sharing! Looks like so much fun! I had a blast, Gwen! I’m glad you enjoyed reading about part of our trip!